Featuring the Undaunted of Elder Scrolls Online! The Banished Cells are located underground on the second largest of Summerset Isles – on the northern part of this lovely Archipelago called Auridon. There are many mobs, enemies and five tough bosses within The Banished Cells. Yet, there is a particularly dangerous Big Boss down there that could create dire consequences were he to return to the surface of Tamriel to wreak havoc on the living. Dare you try to stop him? Well alright then, you might as well make the best of it then young hero, because this will be one of the first Aldmeri Alliance Area group dungeons you can try; and you will certainly be put to the test if you venture within. This guide will help you make your adventure of The Banished Cells the most rewarding – should you survive. Perhaps you will stumble upon The Banished Cells in your adventures in Auridon, and meet the Keeper of this Dungeon, (called Keeper Cirion), because you were curious enough to try to venture inside and somehow lived long enough to meet him and pick up this quest. However, the best and most rewarding way to get The Banished Cells Quest is from The Undaunted! The Banished Cells Quest is the first unofficial initiation quest you will get directed towards by The Undaunted if you dare to join their Guild. So if you are going to brave The Banished Cells -- you may as well earn the right to stop being called a ‘Milksop’ -- by earning the right to become one of The Undaunted! Go to the Salted Wings Tavern of Vulkhel Guard, which is in the Aldmeri Dominion Area of Auridon, just up the steps from the docks. You may hear the patrons calling out -- UNDAUNTED! UNDAUNTED! WE ARE THE UNDAUNTED! You are in the right place. 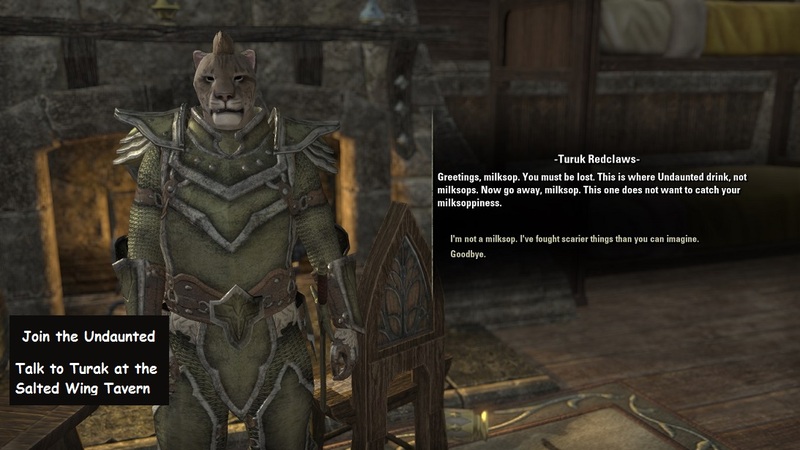 Now go upstairs and look for a Khajiit named Turuk Redclaws. Go through all of his dialogue, which made me burst out laughing, by the way. It’s great. You want Turuk Redclaws to invite you to join the Undaunted, but before you are all the way in, first you will have to prove yourself by facing down the ghost of a dead king in The Banished Cells. The location will then appear on your map in the far north of the Isle and look like a torch with a + plus sign next to it. Accept this mission and a Quest will also appear in your Journal and will be called: One of The Undaunted: Enter the Banished Cells. If you are below Level 12, the quest title will appear in red letters to let you know, it’s still way over your head, but you can go when you are ready; and you will get a rise in some of your skill stats just from accepting the challenge from the Undaunted. While you are there at the Salted Wings Tavern, talk to three Undaunted NPCs standing near Turuk Redclaws and you will get further rises in some of your skill stats by going through all their dialogue. These NPCs include High Elf, Tina Talisse and Woodelf, Venomous Faundil. If you also speak to the Aldmeri, called Mindil the Untested, he will give you locations of two dungeons in two other provinces of other alliances which you can travel to from your world map whenever you want to, once you have finished the Banished Cells. 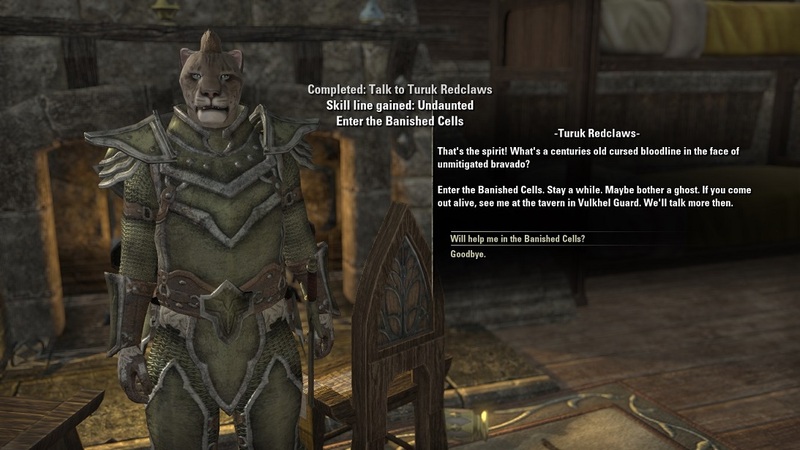 By the way, likewise if you are not in the Aldmeri Alliance, you can do the Banished Cells Quest by traveling to it from another province (Daggerfall Covenant or Ebonheart Pact), only after you have finished your first group dungeon quests there, which will be either Spindleclutch or Fungal Grotto. Now, do you really think you are ready for the Banished Cells? The only way to find out -- is to dare! Now that you have discovered the Banished Cells one way or another, what can you expect? You can expect the mobs inside to be anything between level 12 and 16, and though it is recommended you be at least level 14 to even attempt this in normal mode; it is possible to do it at Level 12 if you have a really good well-rounded group of at least four. Try using Healer, a Tank and two DPS; but by all means bring a Healer! If you make it past any mob that spawns as you enter by helping an NPC defeat them, you will meet this good keeper leader called Keeper Cirion dressed in what looks like a Templar Armor, who will officially set you on your quest now called “Banishing the Banished”. Keeper Cirion will tell you how Daedra infected this underground prison, and of the prime objective of defeating the Ghost King Rilis – however you must defeat others first and follow his instructions and any tips for completing each of these objectives -- reporting back to him success, to obtain the next objectives. You will need to find Keepers and to defeat spawning mobs, skeletons, banished sentinels; and their conjured helpers, traps and spells in order to do so. So you will need to complete at least five objectives as instructed by Head Keeper Cirion, by defeating these 5 Bosses and any of their minions or summoned helpers. To win this quest you will have to defeat the final Big Boss, who is the evil ghost of a King called High Kinlord Rilis. Each time you try to complete an objective and find and reach a Keeper in The Banished Cells, before being able to defeat the boss and his minions who are trying to stop you, you will have to face angry mobs, so keep a healer nearby who can keep an eye on your group members and keep healing them, as you fight. Dodge spells as best you can, as you will usually see their displayed affects in time to jump or dodge them if you stay alert and quick. Concentrate on ridding the angry mobs (and the Summonings of any bosses first), or they will overtake your group and you and kill you before you can even fight the boss. You may want to bring several filled soul-gems with you, so if you get killed you can resurrect back into The Banished Cells instead of going all the way back to the nearest Wayshrine; and having to get back there across the map! However, below you will be given some help to stay alive. As you reach the this Keeper, (Aredlur) angry mobs will spawn which you must survive, to then face and defeat the sub-boss called the Cell Haunter. He uses the ranged icy cold damage spell called Winters Reach, and angry skeletal ads. He also uses a green channeling spell that hurts his enemy and leeches their health and perhaps stamina to himself, so have the Healer try to heal the player, as someone breaks Cell Haunter’s line of casting stream to and from the victim; before he drains all the life from the target. The Cell Haunter is a dangerous ghostly foe! As you are looking for Keeper Two (Voranil), you will see a stone looking door up on a raised stone step platform, and to unlock the door you must press a crystal button on the wall. However be ready for an angry mob of Banekin to spawn in the middle to try to stop you once you first press the crystal! Keep defeating the mob and then pressing the crystal again fighting the next enemies if need be, until you can get through to face a terrible charging Clannfear. Be careful, because you will need to interrupt his attack to break free, if he uses Shadowrend on you. To interrupt spell attacks in ESO you must hold down right mouse button (MB2) and tap left mouse button (MB1) simultaneously. However if the Cell Haunter uses Shadowrend to spawn a little shadow clone, DPS should be ready to take it out ASAP! Also, be sure to avoid Shadowrend’s circular red-marked tail-swipe. For you will then face the one who is called ‘Angata the Clannfear Handler’, and she is called this for good reason; as she summons super-tuff Clannfear to help her try to kill you all. You must defeat her reconjurable Clannfear to even be able to get a chance to deal with Angata, who also uses a ranged inferno fire-staff attack! She also uses fire-cloak, then fire-balls and throws fire-pools on the ground. When you have defeated her Clannfear and her, return to Head Keeper Cirion for an update and further plans. Find Keeper Imiril and defeat the Skeletal Destroyer. As with the other challenges, you will have to fight others before you will be able to kill the boss, in this case to get to and kill the Skeletal Destroyer. The Skeletal Destroyer has his tricks too, because he will spawn skeletal ads that can explode and use random high-damage AOE on your group. He uses AOE Cone Slam, the Dead Zone ability too. When you see him stomp his giant skeleton feet, he is about to and lay a big red-black dead zone circle on the ground that can kill you if you do not jump away quickly enough. Remember to keep your Healer’s eyes on your group member’s health points, to keep your health up and be ready for a tuff-fight with this huge Skeletal Destroyer, so you can rescue Keeper Imiril. This is the last Keeper you need to rescue, but you must go back to head Keeper Cirion to plan further for taking out the final Big Boss, in the next two steps. Now you must first kill the Banished Sentinel, before even getting to Rilis in the next objective, and to do this you must again keep your Healer nearby, and use DPS to first help kill his mobs of Banished Sentinels and ads so you can finish him. Good Luck! Well if you made it this far, without spending all your filled soul-gems to be able to resurrect back into the fray after being killed and killed, then the worst is over as you will face your final foe. This Big Boss is bad Ghost King called High Kinlord Rilis is standing by his throne, with his attack rotation, and is able to send the magickal red circle traps of purple-blue destructive energy, to deal you high damage if you do not quickly jump away from them in time, instead of stepping in the circle-traps. Don’t let him use his ranged knockback to push you into a Daedric Tempest he has made. When you see him raise his sword up in the air, he is about to cast Daedric Tempest. To make matters worse, Rilis has The Feast, which are greenish orbs that appear to float to him and around him by the throne area, and that heal him when they touch him; so you must take all these Orbs out as fast as you can or he cannot be killed. Focus on destroying the Orbs first as fast as he spawns them; so you can kill him. If you dodge his circle traps that flame-up purple-blue bad energy and destroy his Orbs, he is so much easier to kill. Once you have defeated High Kinlord Rilis you can go back to the head keeper, Keeper Cirion and get you’re his rewards for you, which will consist of; one skill point and about 292 gold coins, and an item, such as a Helm called Blessing of The Keeper. If you were directed to the Banished Cells as an initiation test for joining the secret Undaunted Guild, you should have gained some extra benefits then, and their skill-line. So now that you have completed the clearing of the Banished Cells, you should also go back to report your victory to the Undaunted to prove you are no longer a ‘Milksop’. Now that you are an Undaunted instead of a Milksop, you will get to obtain special training for extra advantages from the Undaunted too! You have earned the right to see what further rewards await you as one of the amazing fearless Undaunted, and as one who has come victorious out of the terrors of the Banished Cells! Thank you so much! i am glad You enjoy it! :) Have fun!